A native California frog once on the brink of extinction is making an encouraging comeback in Yosemite National Park, raising hopes for amphibians like it worldwide that are dying off at an alarming rate, researchers said Monday. The Sierra Nevada yellow-legged frog — little more than 3 inches long and known for the coloring under its hind legs — was once the most abundant amphibian in the mountain range. They were so numerous that they bounded by the dozens into lakes and streams with each step of an approaching person, says lead researcher Roland Knapp of the University of California Sierra Nevada Aquatic Research Laboratory. Their numbers began to plummet roughly a century ago as they were gobbled up by non-native trout stocked for fishing. Disease later struck, removing them from 90 percent of their native habitat in the Sierra, scientists say. Efforts to save the frog from extinction have led to a sevenfold increase in their numbers in Yosemite in the last 20 years, says Knapp, who charted the frog's rebound in a study published Monday in the Proceedings of the National Academy of Sciences. "It's got a long way to go to get to where it was," he says. "It's certainly an important milestone." Park officials stopped stocking non-native fish in some Yosemite lakes, helping the comeback, and it appears that the frog has developed a resistance to the disease deadly to amphibians, called the chytrid fungus. The disease has led to the extinction of more than 200 species of amphibians around the world in the last 30 years, Knapp said. The frog's ability to develop a resistance, combined with better management practices, could reverse the decline of amphibians elsewhere, researchers say. The rebound of the yellow-legged frog is limited to Yosemite, which makes up 13 percent of its historical habitat in the Sierra. Researchers say that elsewhere in the range, the frog remains scarce. It is still protected as a federally endangered species, and state wildlife officials consider it threatened in California. 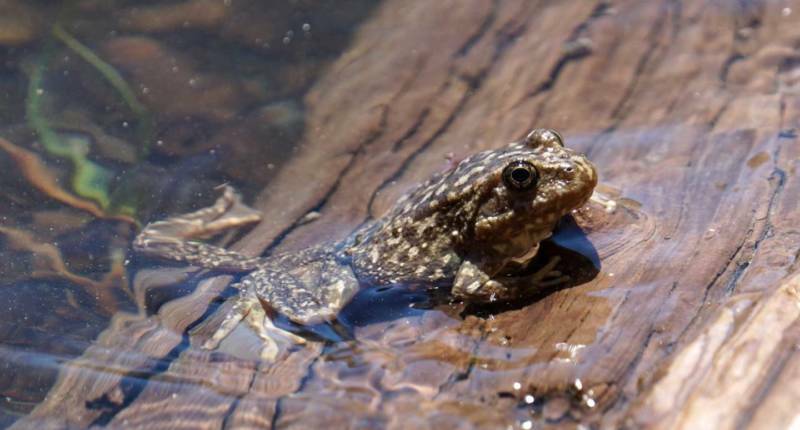 Yosemite National Park called the rebound a rare success story in the world of endangered species, and one that made them hopeful the yellow-legged frog would eventually come off the endangered list. "A lot of people think that species linger on this list in perpetuity and we very rarely see species coming off the list," says Rob Grasso, the park's aquatic ecologist. "This shows it can be done, and even such an imperiled species as the Sierra Nevada yellow-legged frog can recover when the odds are highly stacked against it," Grasso says. "One day, it could be off the list. This gives us tremendous hope."